Oct. 31, 2012 - Why Should You Buy Pro Bi? PRO BITM is a biological feed additive designed to maximize digestive efficiency. An animal’s beneficial intestinal bacteria can be destroyed or depleted and the pH of their environment can be altered during times of stress. Competition, travel, breeding, treatment with antibiotics, de-wormers and other medications can cause this stress. Stress can also be created by alterations of weather, environment, feed, and water. Research has proven that there are two basic types of microorganisms. The majority are beneficial or good bacteria, and the others are pathogenic or bad bacteria. The key is balance of good and bad bacteria. When proper balance is maintained, an animal is healthy, grows at a good rate and converts feedstuffs efficiently. Animals become ill when balance is upset due to stress or other factors. Feed conversion and animal health can decline. Knowing this balance is important, companies started providing direct-fed microbial (pure cultures). The purpose was to give high levels of healthy or good bacteria to prevent the bad bacteria from taking over the system. This has led to a numbers contest where producers buy high concentrations of good bacteria. Lactobacillus Acidophilus is one of the most common. When we examine how these microorganisms function, we find some interesting points. Lactobacillus Acidophilus does not attack bad bacteria. It is a Probiotic that competes for space. Once established, it develops a zone around itself where pathogenic (bad bacteria) do not grow. This area is called the "zone of inhibition," and it prevents the growth and development of pathogens. 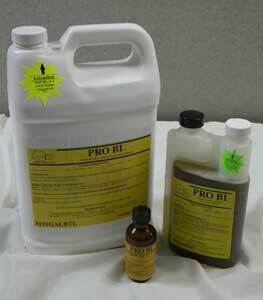 PRO BITM provides these properties, which is why PRO BITM functions without living organisms. PRO BITM in final form, is not a source of live organisms. However, it does supply the by-products they produce. 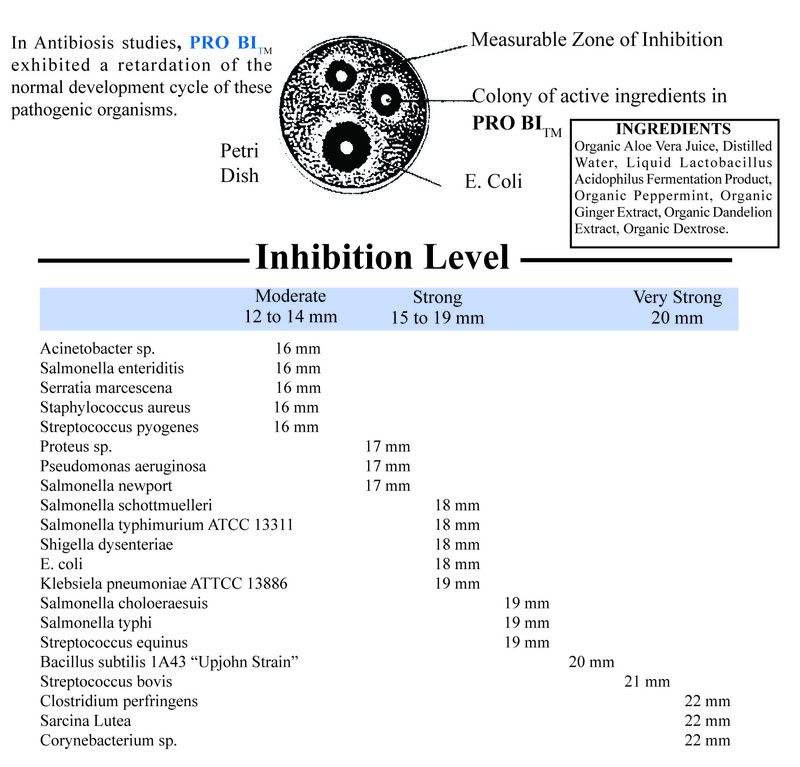 The active ingredients in PRO BITM retard the growth of 22 pathogenic organisms. PRO BITM provides the benefits obtained from live cultures without the problems and concerns of using pure cultures. Horses: Before, during and after travel and competition. Along with de-wormers, antibiotic and other drug therapies. Use also with alterations of feed, water and/or environment: 1/4 oz. twice daily, orally or with feed. Foals: Administer 1/2 oz. shortly after birth. ADMINISTER: 1 oz. orally, immediately and contact your local Veterinarian for appropriate diagostics and treatment, if neccessary. Swine: Baby pigs (Scours): 1 ml (cc) twice daily syringed or 2 ml (cc) per gallon of milk replacer. Cows: Bloat: 30 ml (cc) daily on feed, tubed or syringed orally. Calves: Administer 10 ml (cc) shortly after birth. Receiving or Stressed Calves: 10 ml (cc) daily for 7 days on feed or syringed orally. Maintenance for Calves: 5 ml (cc) daily on feed as needed. Receiving: 2 ml (cc) per calf per day for 7 days. Maintenance: 1 ml (cc) per calf per day. Small Animals: twice daily, orally or on food. Dogs: 20 drops and 10 drops thereafter. Cats: 10 drops and 5 drops thereafter. MAY BE USED AT ANY SIGN OF DIGESTIVE DISORDERS LIKE DIARRHEA OR COLIC. PRO BI™ does not need to be refrigerated. It has NO EXPIRATION DATE. "I love the product; by adding Pro Bi along with a few other management practice changes, I have seen a drastic improvement in my animal. He has gained almost 75 lbs in under a month! I was at my wits end, and by adding Pro Bi & pasture board to my regimen of Succeed & Omeprazole, I have never seen my horse this healthy. I can't wait to wean him off his ulcer medication and see how he does. Thanks again for the product & the quick response to my questions. I really appreciate your excellent customer service." "I just wanted to thank you for your wonderful product – I am an endurance rider and use Pro Bi at the rides. This weekend, I had a horse develop impaction colic following a change of weather. I remembered a speaker telling me at Julie Jackson’s clinic last year that if I gave my horse Pro Bi, I would have a horse to treat when the vet arrived. Thank you for a wonderful product. It is my favorite completion award at endurance rides. I received some Pro Bi at Tony Troyer’s ride and could not have been happier! Everyone should have several bottles on hand. I have always used it as a preventative, but it really saved my horse’s life when he needed it most." "I needed to transport my horse from Virginia to Nevada. Dr. Joyce Harman suggested giving her Pro Bi before, during and after her transport. She got it before and after, not sure how many times during. She did so well. The transporter said if more horses were like her, their job would be really easy. She arrived with wobbley legs from 5 days on board (including being near tornadoes in OK), but she walked off, ran off a little energy in the round pen, and rested in a non-moving pen. She remains her normal, calm self despite the changes. She likes the taste of the Pro Bi. She searches me over to find the Pro Bi and smacks her lips a lot while she swallows it. I won’t say she likes it better than apples, but it’s close!" "Our dog had been bitten or stunk by something - we tried everything! I called Jim for advice – He recommended putting Pro Bi on it – I started right away – the first day I took a towel and padded the Pro Bi on the sores three or four times. Within 24 hours, it started looking better! We were shocked! I purchased a small spray bottle and continued 2 or 3 times a day just spraying the Pro Bi on the wound – It was amazing how well it worked!"